Spring is around the corner and admittedly, while we’re some weeks away from days that contain any meaningful warmth, the increasing daylight hours alone are a reason to feel encouraged. And with spring in our sights, so begins our craving and inclination towards all things fresh. After the long winter months of closed windows, central heating and trying to stay on top of mildewed bathrooms, we can’t wait to get the windows open and let our homes breathe! Inviting fresh air into your home again feels invigorating because the feel and experience of fresh air is good for our wellbeing and, at Millbrook Beds, we’re aware how important breathability is in your homes and we happen to know that it’s also pretty important for your sleep quality too. That’s why we use natural fillings such as Hampshire wool and English cotton which are renowned for their breathable and thermo-regulating structure. It’s about more than just a notional feeling of wellbeing or freshness, better temperature regulation reduces sleep disturbance and breathable fillings are also better for the lifespan of your mattress too. 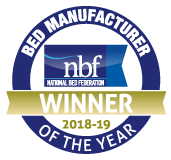 So breathe a sigh of relief as spring is almost here and let your sleep breathe easily all year round in a luxurious handmade Millbrook Bed.